A good release starts with a good grip. The release of the club is one of the more difficult aspects of a proper golf swing. Many amateur golfers struggle for years trying to learn how and when to release the club. A sound swing is characterized by release of the wrist hinge just past the point of impact as the club rotates. To achieve a proper release, you need a good grip, a good backswing and a good downswing. Grip the club in the fingers of your left hand (for right-handed golfers). The "V" formed by your left thumb and index finger should point to your right shoulder. Grip the club in the fingers of your right hand. The "V" formed by the right thumb and index finger also should point to your right shoulder. Keep your grip pressure relaxed. A relaxed grip pressure will help you hinge the club and release properly. Swing the club back with your shoulders and hinge your wrists up. 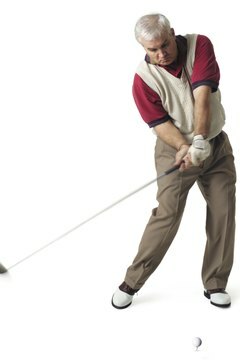 Stop your backswing when your left shoulder is under your chin and you have a 90-degree wrist hinge. The angle from your left arm and the club shaft should form a 90-degree angle. Start your downswing by rotating your hips toward the target. Hold onto your wrist hinge until just before impact. Begin releasing your wrist hinge just before impact. This will help you achieve maximum power. You should fully release your wrist hinge just after impact. Keep turning your hips through impact and let the club rotate over. The toe of the club (outside edge) should rotate over the heel of the club (inside edge). Your right hand will be rotated over the left at this point. Keep turning your hips until they face the target.